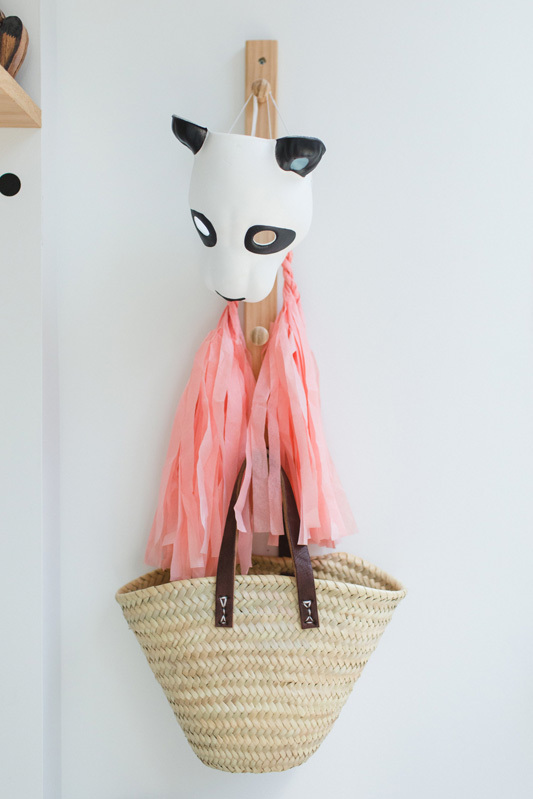 If you’re a Madewell fan-slash-addict, then today’s profile will certainly delight. 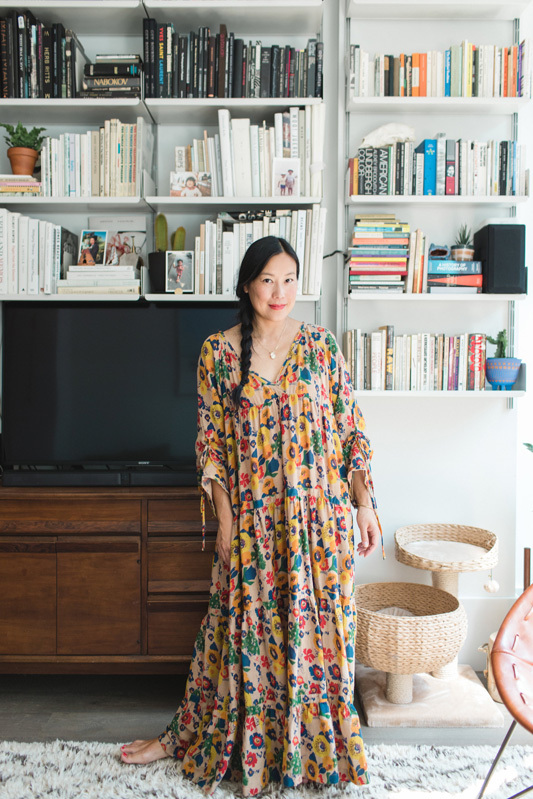 The covetable brand’s head of design, Joyce Lee, opened up the doors to her Williamsburg, Brooklyn home for us. 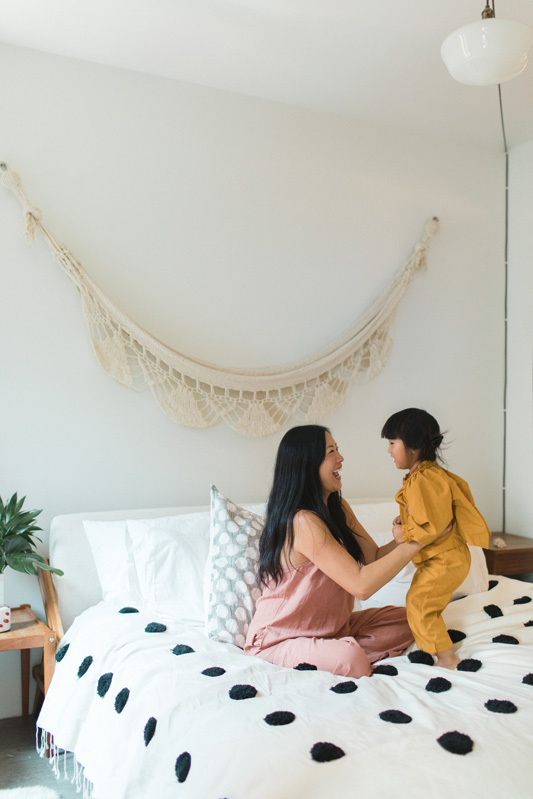 Below, she shows us around her color-, light-, and texture-filled space, while talking about style (interiors and sartorial), the ups and downs of parenting a toddler (Poppy, 3), and adding to her family come January with her baby boy on the way. "We have lived in Williamsburg for the past several years. When my daughter Poppy was born, we were in a cozy 1-bedroom 5th floor walk-up. We converted our walk-in closet into a little nursery, and spent the next year looking for a bigger place for our family. It took us a while to find the right space. We eventually came across our building in the same neighborhood, which is super family friendly. There are lots of kids here, we have friends in the building, and there’s an amazing playroom which we take advantage of on super hot summer days and the days when we are snowed in! 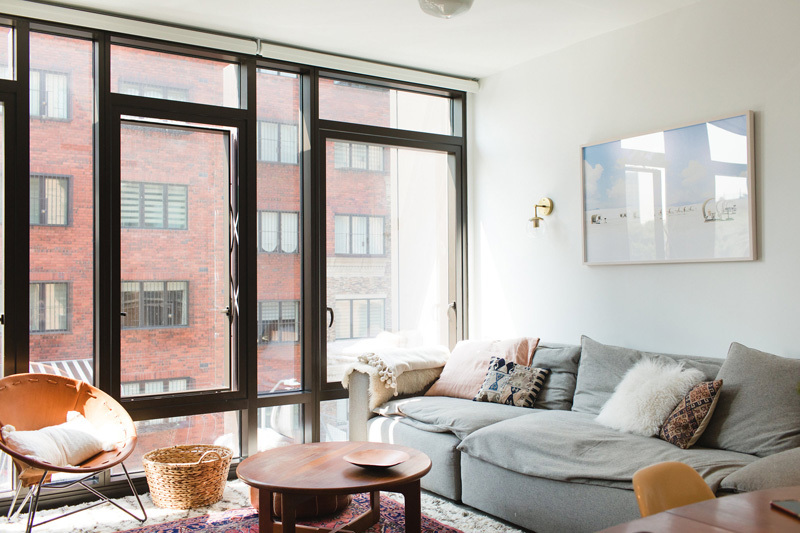 We’ve been in this apartment for about two years now and love how it feels." 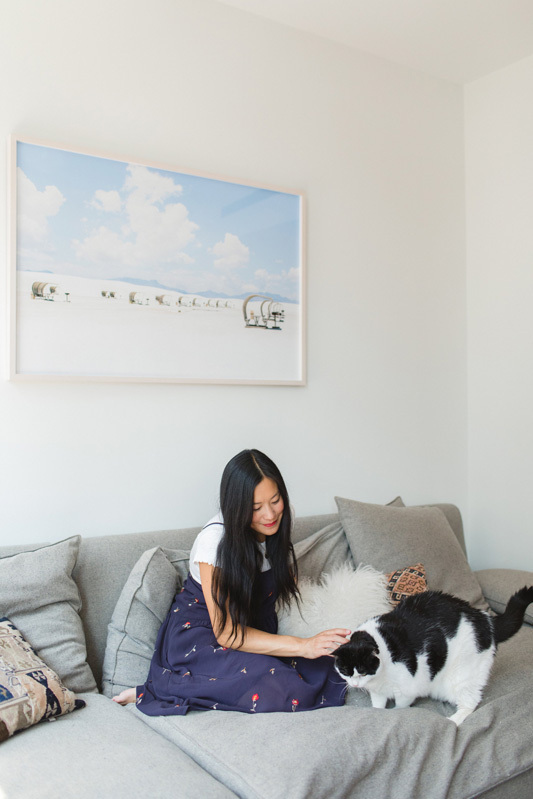 "My husband and I both gravitate towards mid-century modern pieces, but like to keep the space warm, inviting, and cozy." 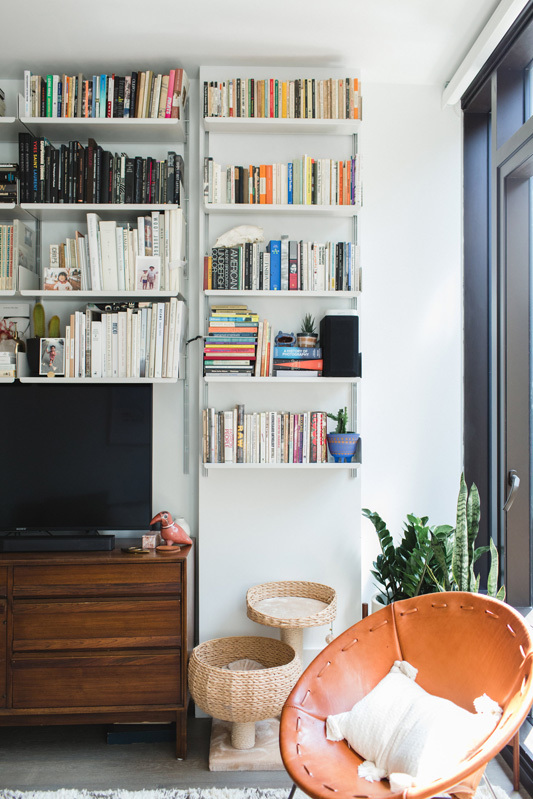 "We started with the bookshelves—my husband James has an impressive collection of books and records, so we were excited to get Vitsoe shelves built into the walls." "The piece I wanted to pick was the couch. I fell in love with it at ABC Carpet, it’s like a giant bed and it’s hard to get out of once you sit down. I also love our Garza Marfa leather chair. It reminds me of our first family trip to Austin." 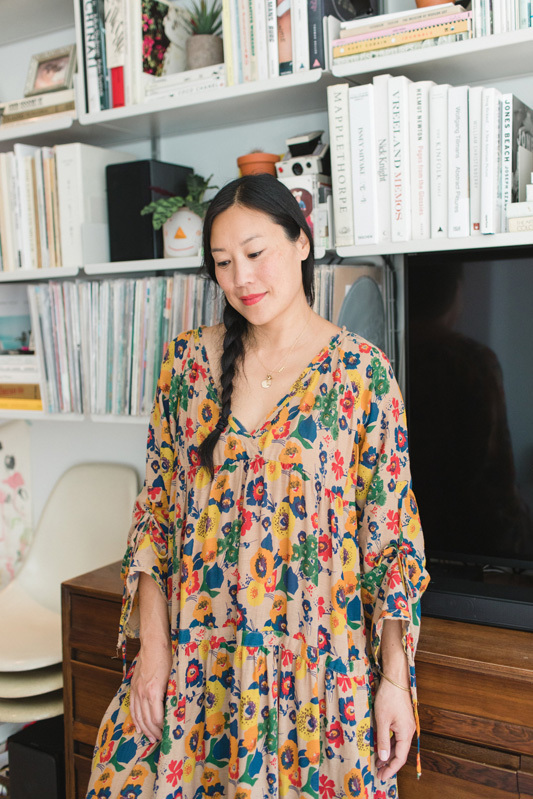 Joyce wears a Madewell dress and tee. 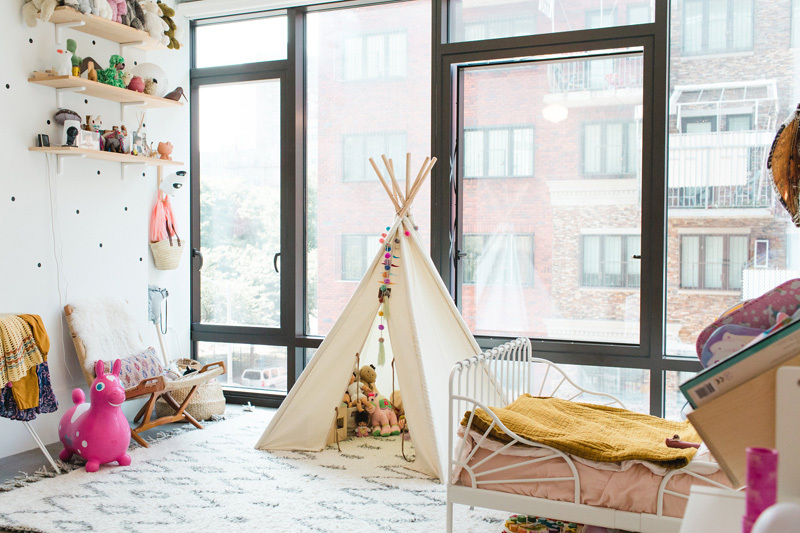 "We created a fun play area in her bedroom, so most of her stuff is in there. 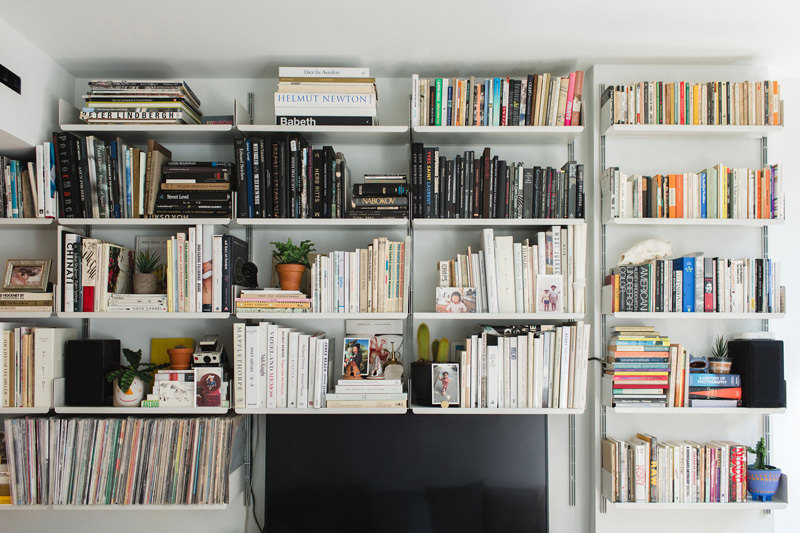 Throughout the day, things definitely move around, but we like to keep it tidy and luckily she is great at putting things back where they belong." "There’s not much to it other than keeping things simple and only bringing in things we absolutely adore. 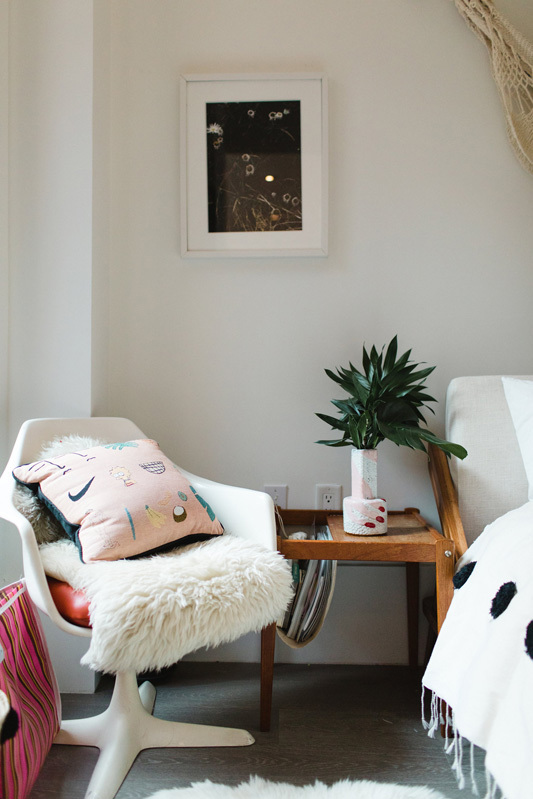 I love textiles, texture, and keeping the palette light and easy." 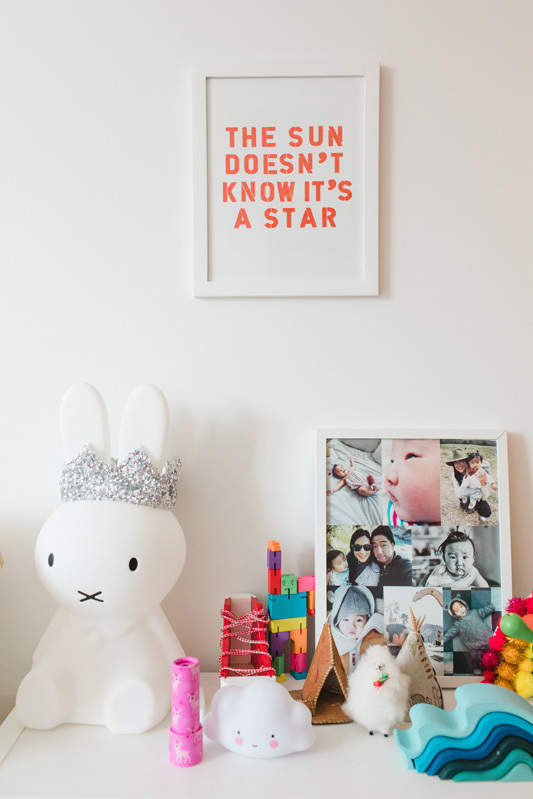 "Poppy's room is fun. 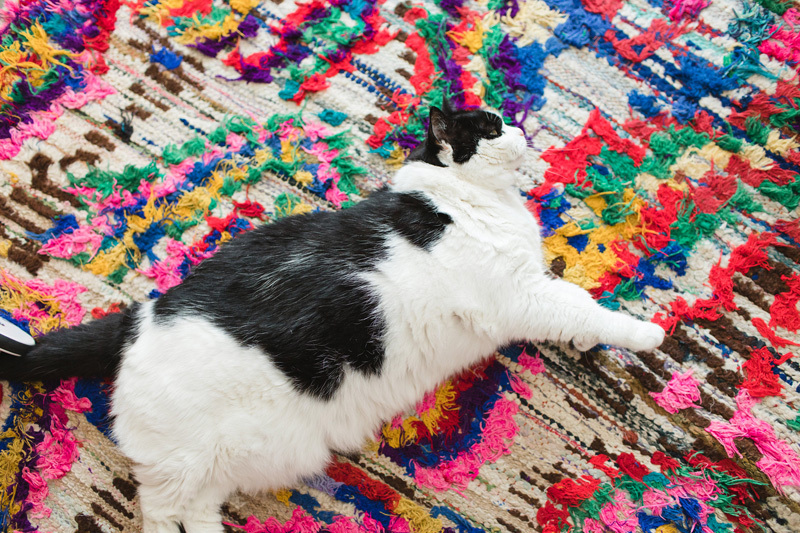 I especially love the crazy colorful vintage Moroccan rug—it brings in so much cheerful energy. 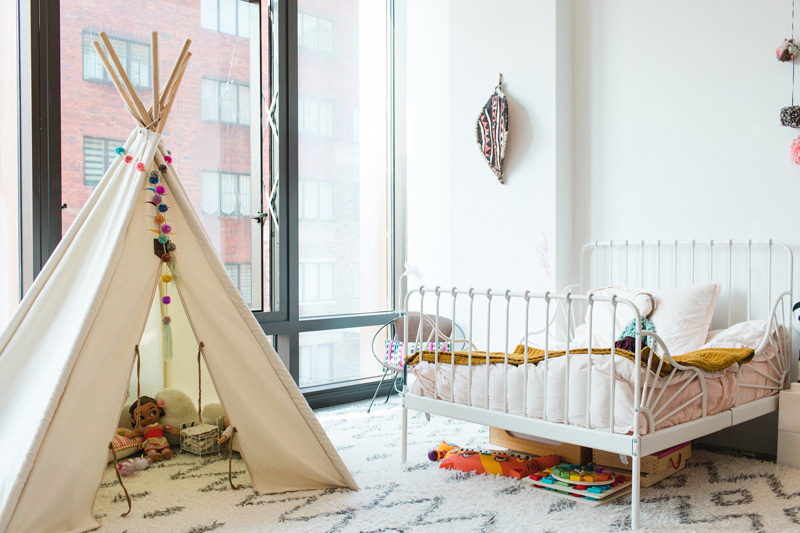 I always wanted a teepee, and fortunately she adores it, too. She likes to 'camp out' in there with her dolls. I got the mini mid-century leather chair for her before she was born, from a prop sale! It was too cute to pass up, and it’s so fun to see her sit in it now!" 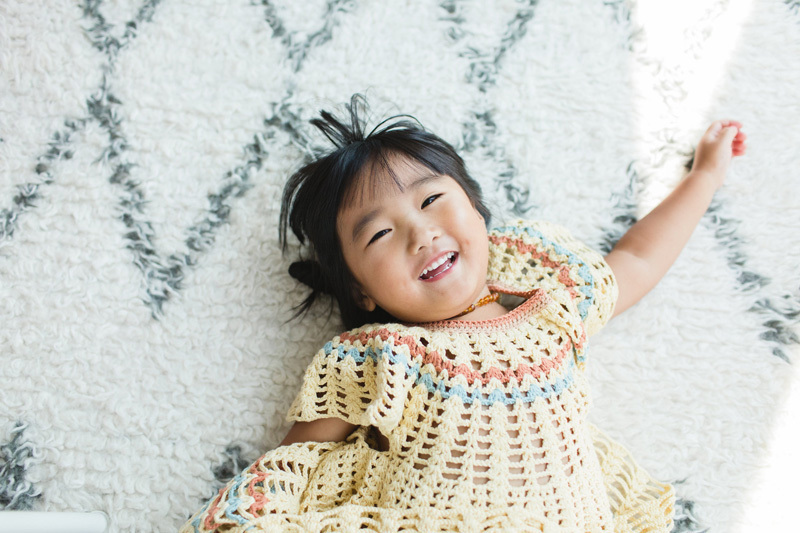 "I love rediscovering things through the lens of my daughter—it is so much fun!" Poppy wears a jumper by The Hey Gang. "That the world is changing so quickly. Raising kids with the presence of technology and social media makes me anxious." "I had always hoped to have a daughter. I secretly started collecting baby girl clothes when I was in college and it’s a trip to see Poppy wearing those pieces nearly 20 years later!" "Poppy is really into painting, building things with her Legos and Magna-Tiles, and putting on 'shows' for us. As long as she has an audience, she loves to make up songs and dance. She also has a pretty amazing bow when she wants you to know she’s done." "My husband and I are both from California, and the Poppy is the California state flower. We both loved the name, so it felt right. We also couldn’t agree on anything else! Her middle name is Lee, which was important since I didn’t change my last name when I got married." "I had a fairly smooth pregnancy the first time around, and got through any discomfort with massage and acupuncture. But I definitely wasn’t someone who was blissfully barefoot and pregnant. This time, I had more nausea in the beginning, but now I’m just craving the typical pregnant lady things—ice cream and pickles!" 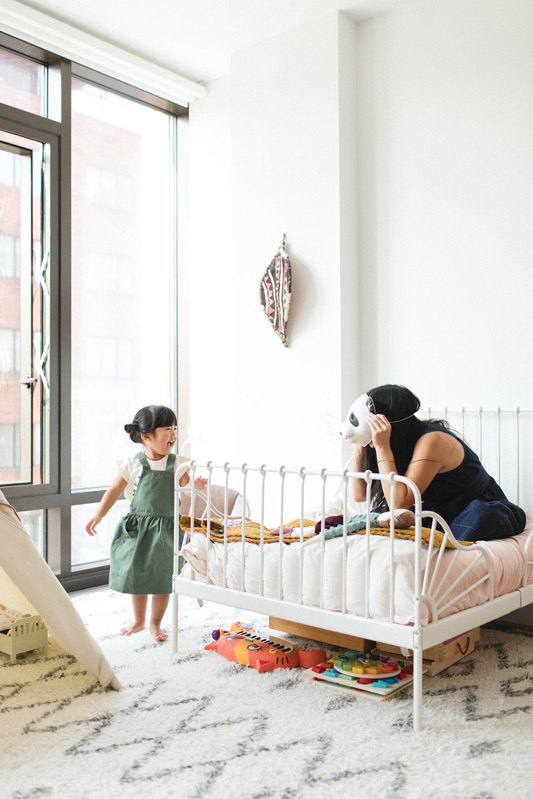 "I had a pretty standard maternity leave—I wished it could have been longer. My husband James is freelance, so he took some time off to be home with us as much as he could." 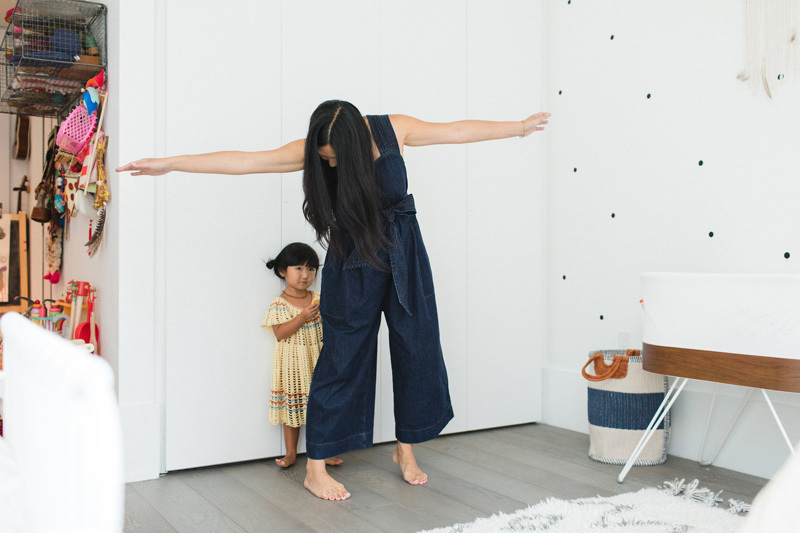 Joyce wears a Madewell x Karen Walker denim jumpsuit. Poppy wears a Misha and Puff dress. 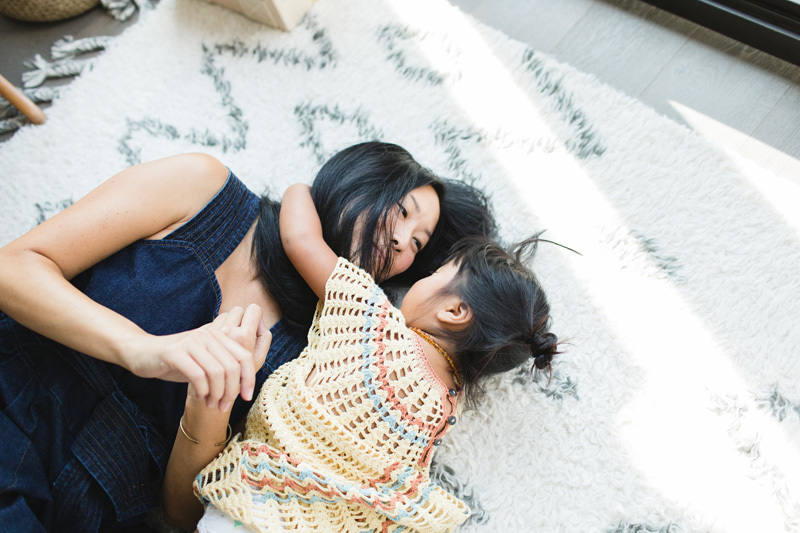 "I prefer talking to mom friends about things and trusting my gut to make decisions that feel right for my child." "I definitely trust my own mom a lot. 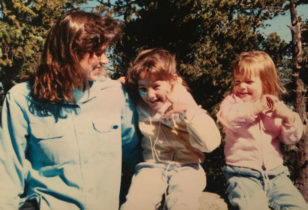 My relationship with my mother changed and evolved after becoming a mother myself. I have so much respect for her and everything she did for our family." Pon Pon the cat, who has his own Instagram account. "My younger brother and I grew up in a pretty strict and traditional household, but my parents provided us with happy experiences and memories—family trips, lots of time outdoors, and we grew up with a lot of cousins our age." 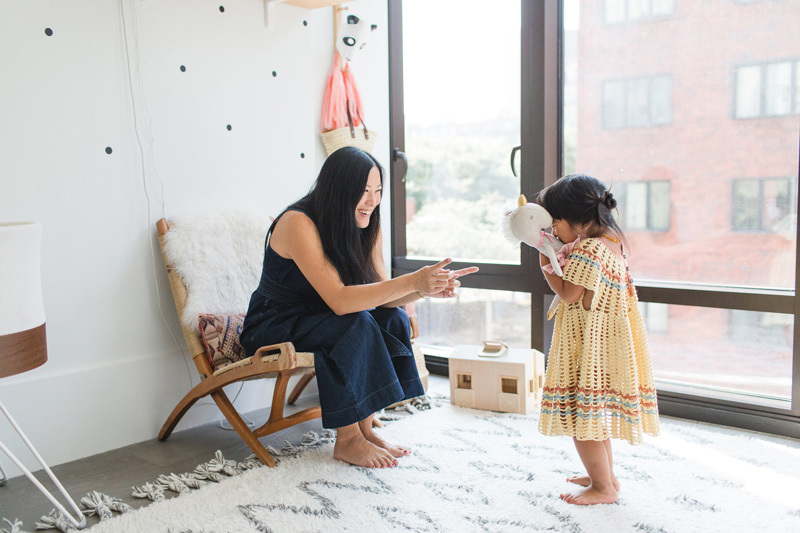 "I am grateful for the structure and the boundaries that my parents gave us, but I think the main difference is that I hope to guide my kids with a gentler hand, and allow them the room to grow into themselves." 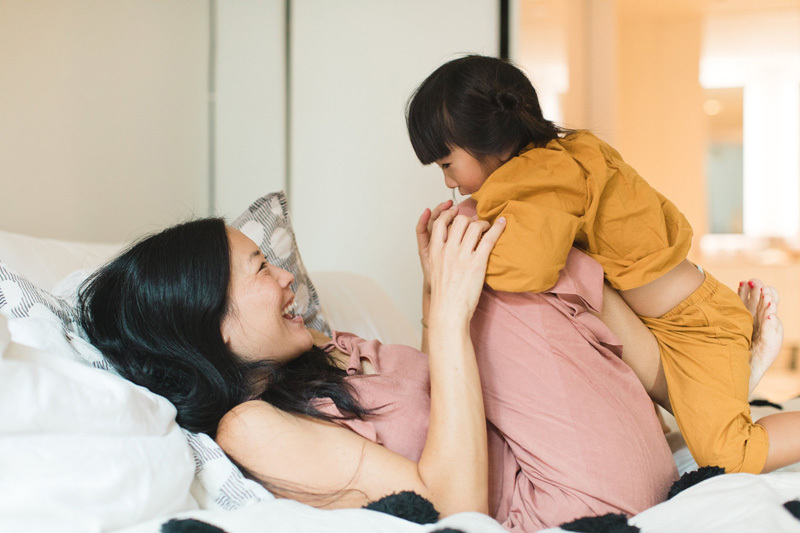 "We are both mindful of how we balance giving her room to make her own decisions with discipline and setting boundaries. I rely on my intuition to tell me how to guide her through this world." "It’s cliché, but try to soak it all in, and enjoy every moment—even when it’s tough—because it is temporary and it will go by so fast." "I’m super excited that Poppy will have a sibling—I think she’s going to be an amazing big sister (I hope!). 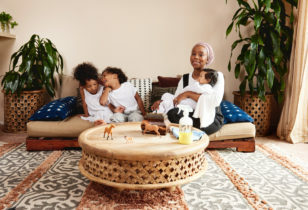 While I’m a little nervous about the initial transition, I can’t wait for us to be a family of four." "I love that I have the opportunity to raise both a girl and a boy—I know both experiences will be so different. I have a younger brother, and always felt that boys who grew up with sisters were way more balanced as they grew up." "Casual, but still polished, and a mix of tomboy and feminine. It hasn't really changed except that I never wear heels anymore!" "I love jumpsuits, monochromatic looks, lots of vintage denim, stripes, bohemian tops, sneakers, and flat sandals. 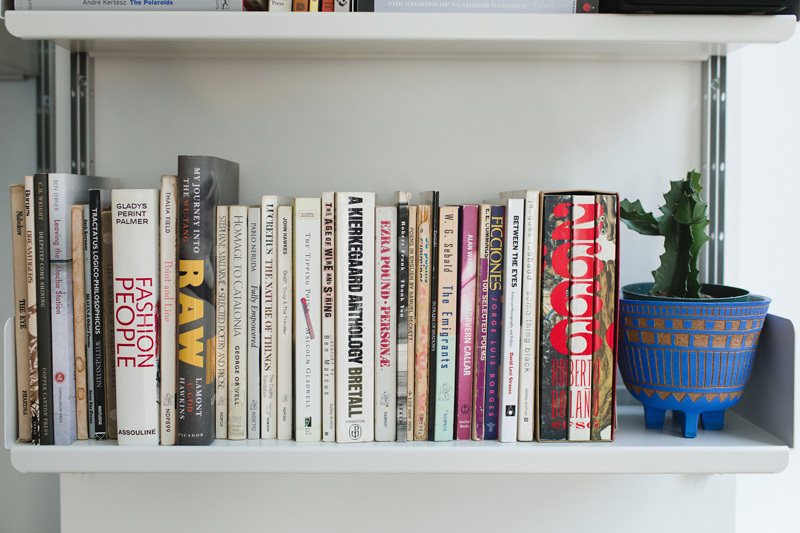 And there’s definitely a good amount of Madewell in the mix!" "I’m not a huge trend follower, however, I am very happy that jumpsuits happen to be trending! It used to be so hard to find a coverall!" "It’s pretty simple and clean. I'm a fan of plant-based natural beauty products. I love Sisters Body for their shampoo, conditioner, and body wash. It is heavenly and makes me feel relaxed. I am currently switching off between Peet Rivko’s gentle cleanser and Beautycounter’s cleansing balm. I use minimal makeup—Chantecaille’s tinted moisturizer, a bit of brow gel, mascara, and Lucas’ Papaw lip balm." "I try to meditate in the shower every morning before the day begins, and whenever possible, I swim laps, which is my favorite kind of exercise." "I get mani-pedis and massages when I can! And when I have a few extra minutes in the shower, it is a treat!" "We got a king size bed when we moved in here and it basically takes up the entire room, but we are happy to have it that way! Since we don’t have a yard here, we decided to hang our hammock (James picked it up on a trip to Panama) above the bed. 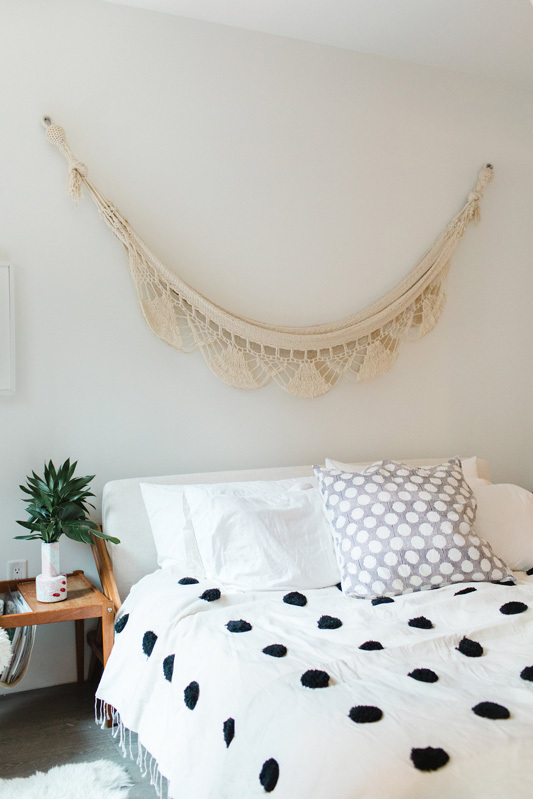 I also love the pom-pom bedspread, because I don’t think I’ve ever met a pom-pom I didn’t love!" 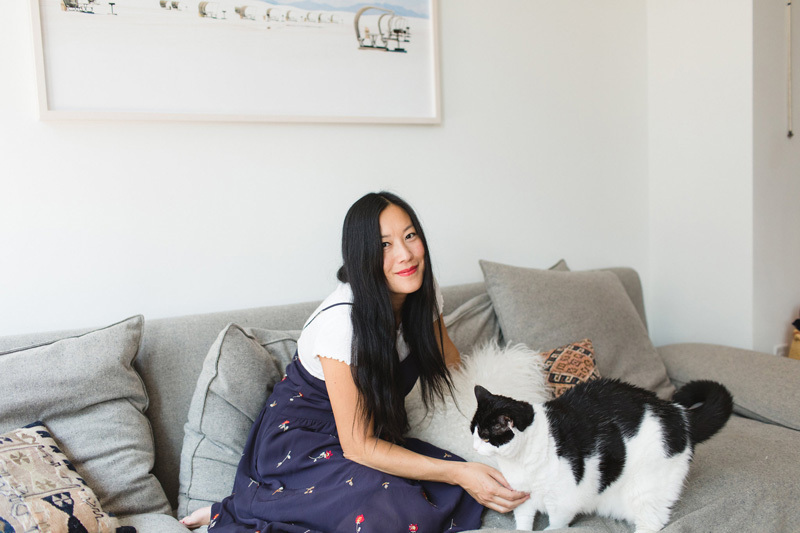 "I head up the design team at Madewell, where I’ve been for 10 years. It’s been exciting seeing it evolve and grow to what it is now. I work with such an incredibly talented team and am so grateful to get to do what I do everyday." Joyce wears a Hatch Collection Noa jumpsuit. Poppy wears Yearling by Doen. "I love to travel—just being away from the day-to-day gives me room to feel inspired. Also, shopping for vintage. Finding a gem in a giant pile is so rewarding! I’m always inspired by old textiles, color, and pattern." "I grew up in a small town in the Bay Area in California. Since my parents weren’t exactly thrilled with the idea of me attending design school, the closest I could get was a Textiles and Marketing program at UC Davis. After graduation, I moved to London and interned for Wallpaper’s fashion department, which was an incredible experience. At that time, I was obsessed with Marc Jacobs and what he was doing with accessories, and was determined to eventually work for him. I then moved back to San Francisco for a few years and worked for Levi’s before eventually moving to New York to attend FIT for accessories design. I lucked out and got to work for Marc Jacobs for two years, designing shoes and bags. 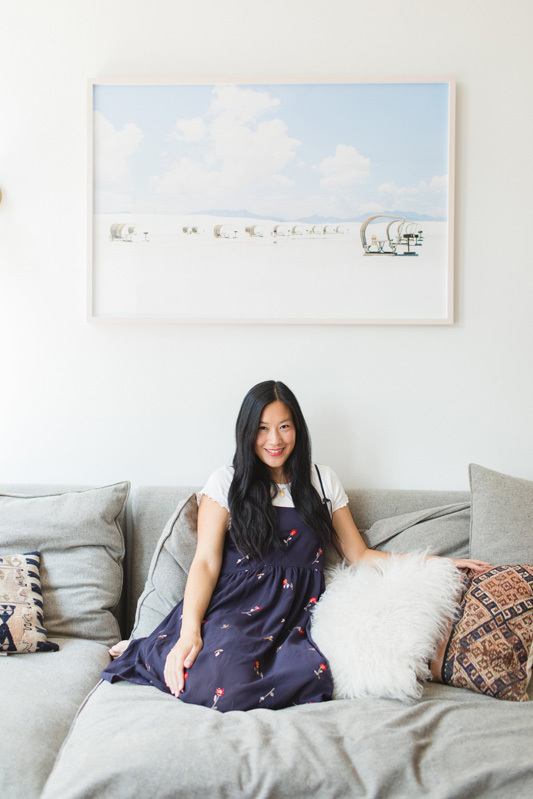 I actually freelanced for Madewell when it was still a little concept (there were no samples, no stores at that point) and after working at a couple other brands, I landed back at Madewell and have been there ever since." "It’s more of a balancing act now. Transitioning into becoming a mother alongside my career has been a challenge, but it’s also a lot of fun. I’m lucky to love my job and I am also grateful to be a mother, I couldn’t imagine not being able to have both." 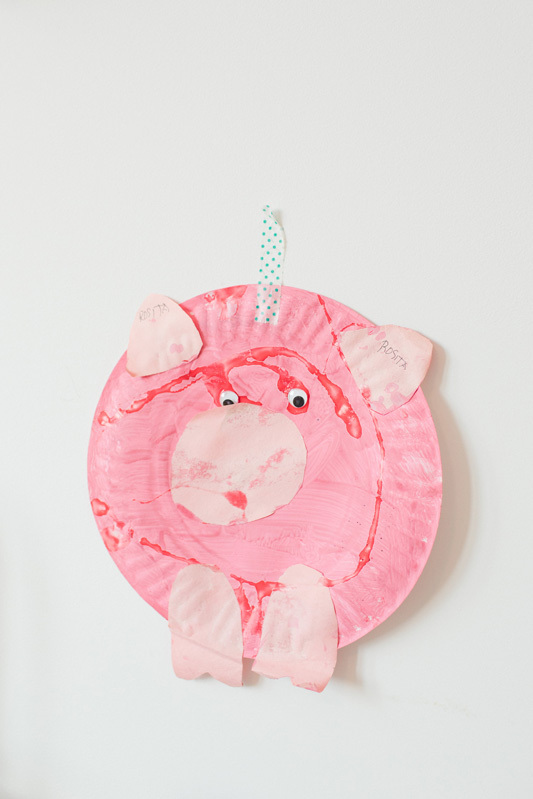 "We have a wonderful nanny who we all adore, which makes getting through the week much easier. Poppy also has lots of babysitter friends, so we are grateful to have the support when we decide to go on a much needed date night. The grandparents all live on the other side of the country, so it’s a treat when they come visit!" 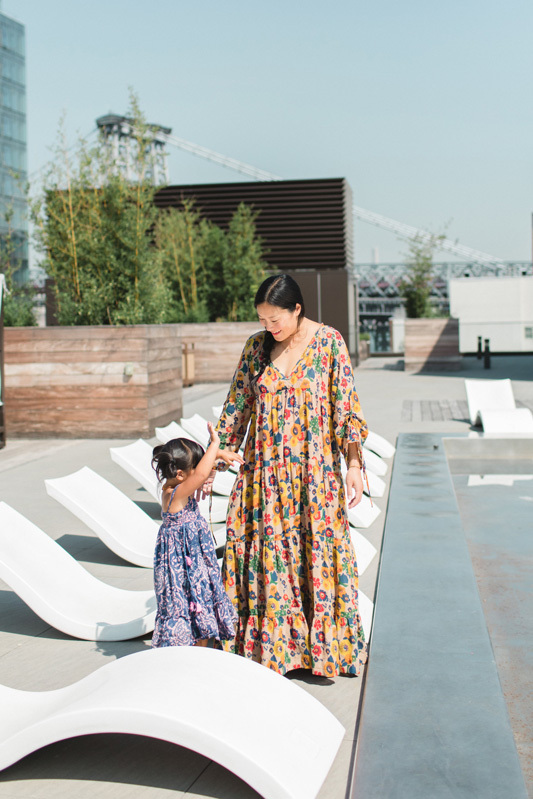 "I cherish the time I get to spend with my daughter and husband, and my goal is always to be fully present. And when I’m at work, I have to be focused and efficient. I’ve also learned that it’s crucial to allow yourself to let go of what isn’t important as you try to balance it all." Joyce wears a Warm dress and Amanu sandals. Poppy wears a Banjanan dress. "I have so much respect for my own mother and I’d love for my daughter to grow up with that same feeling about me." 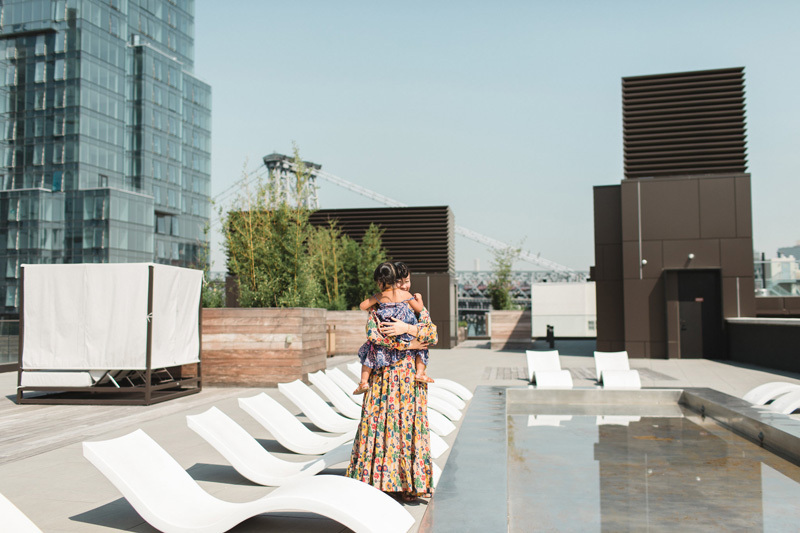 "I love that she is surrounded by so much in New York—she’s a curious, strong, and fearless little girl, and really soaks everything in around her. We try to take advantage of everything this city has to offer—museums, parks, zoos, the food, the mix of people! She is so lucky to experience so much culturally at such a young age. I imagine that it will really shape her as she continues to grow up." "We’d love to be closer to our families in California at some point." "We love exploring—taking local road trips on the weekends upstate, or to nearby beaches. Poppy’s at a really fun age right now. We took her to Coney Island and she was obsessed with the rides and games. We just checked out Asbury Park in New Jersey this weekend. One of our favorite neighborhood restaurants is Samurai Mama, since Poppy has a love for noodles. For shopping, my favorite store Oroboro used to be just down the street in Williamsburg. I used to shop while Poppy would nap in the stroller. I’m really hoping they move back soon! I also love Warm in Manhattan, it’s one of my other go-to shops where I can always find something." For more on Joyce, her family, and her work, follow along with her Instagram feed.